Of the lower 48 states, those in the West have the most diverse landscape. Within their borders lie the tallest mountain (Mt. Whitney at 14,494 feet) and the lowest point (Death Valley at 282 feet below sea level). There are rain forests, deserts, volcanoes, foothills and valleys, and thousands of miles of coastline. This variation affects the types of mushrooms found and the timing of their appearance. Fall and winter are the best seasons for mushroom hunting along the coast and in the foothills. Mushroom clubs in the Pacific Northwest and in northern California often schedule their coastal forays October through January, months when the high mountains are snow-covered, with no hint of fungi except for the occasional tree conk. High elevations are productive for fungi after snowmelt in late spring, although fall can be productive when there is rain and no frost. The Rockies and high mountains in Arizona can be very productive in late August following monsoon rains. Spring is morel season in much of the West. Inland valleys are not as productive for fungi as coastal areas but mushrooms can be found in many locations during the rainy season and on watered lawns throughout the year. Individual species of mushrooms are typically associated with specific habitats. The Black Morel, Morchella elata, sometimes fruits in large numbers in montane forests the year following a forest fire. Uncertainty is an attraction of mushroom collecting. Fruiting is predictable but never certain. Unless you have seen something a few days earlier with your own eyes, you can never be sure of what is in the field at a given time. Mushroom fruiting depends on the alignment of season, temperature, and moisture. If any of these factors is unfavorable, fungi will be sparse or non-existent. If there has been no moisture during the mushroom season, mushrooms are not likely to fruit that entire year. An early frost may have a similar effect. Moisture is less of an issue for foragers along the fog-shrouded coast, but for those who seek mushrooms inland or in the Southwest where there are two seasons- dry and wet- mushroom hunting for much of the year is restricted to irrigated orchards, lawns, and gardens. There is also the matter of access, which is more of a problem in some locations than in others. Private land may be posted with No Trespassing signs, and park land is often off-limits. Most National Forests are open to non-commercial foraging but may require a permit. Some mushroom clubs have made special arrangements with a local agency to allow picking. If you are willing to pay a fee, there are organized forays on private land, typically with meals and overnight accommodations nearby. These proprietary forays are advertised in mushroom periodicals and club newsletters. Contact information for mushroom clubs and organizations is found in Section 11 (Resources). California and the Western States are rich in abundant and diverse species of mushrooms. 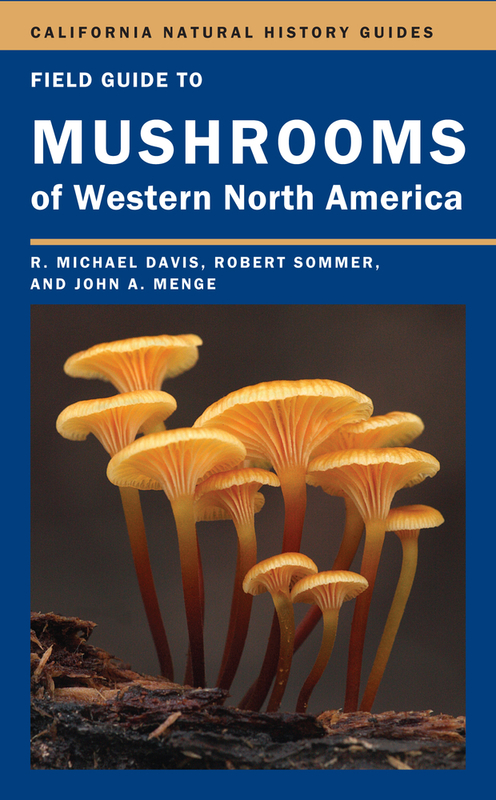 Amateur mushroom collectors and mycologists alike will find over 300 species of the region’s most common, distinctive, and ecologically important mushrooms profiled in this comprehensive field guide. It provides the most up-to-date science on the role of fungi in the natural world, methods to identify species, and locations of mushroom habitats. With excellent color illustrations showing top and side views of mushrooms of the Western States and a user-friendly text, it is informative but still light enough to be carried into the woods. When used to identify mushrooms, keys bring the reader to individual species, with a descriptive text providing cues for identifying additional species. Mushrooms common in urban landscapes are included, which is especially useful for the casual encounter with backyard fungi. The guide also provides a table of both old and new species names, and information on edibility and look-alikes, both dangerous and benign. A section on mushroom arts and crafts features mushroom photography, painting, philately, spore prints, dyes, and cultivation. The guide also offers a comprehensive list of resources including national field guides, general mushroom books and periodicals, club and society contact information, and web sites. · Primary descriptions and illustrations of 300 species of mushrooms plus text descriptions of many more. · Latest word in mushroom taxonomy and nomenclature. Clear discussion of DNA sequencing and new classifications. · Especially good coverage of southern California and Southwestern mushrooms often neglected in other field guides. R. Michael Davis is Professor of Plant Pathology at University of California, Davis. Robert Sommer is Distinguished Professor of Psychology Emeritus at University of California, Davis, and the author of Personal Space and Tight Spaces, among other books. John A. Menge is Professor Emeritus of Plant Pathology at University of California, Riverside. "This is a wonderful addition to the mycological literature for both professionals and amateur mycophiles! A field guide with an emphasis on California mushrooms is long overdue." --Greg W. Douhan, Department of Plant Pathology and Microbiology, University of California, Riverside. 2. What is a Mushroom?